At New Horizon we take very good care of our students who are a long way from home. We recognise that students are here for study, fun and adventure and we support them every step of the way. We are a happy, multi-national school away from the pressures of a big city. People of all ages from 14 - 70 are welcome to join us for 2 to 48 weeks. Our teachers are highly skilled and we teach all levels from Beginner to Advanced, plus IELTS and Cambridge exam preparation courses. 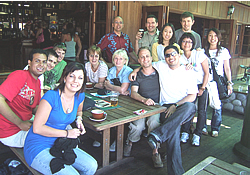 Staying with one of our carefully chosen homestay families will also give plenty of conversation opportunities. Napier city with its great weather, seaside location, wineries and interesting activity programme is a perfect place for both young and old. This Art Deco city on the Pacific Ocean is the ideal place to try something new.